This is an amazing book for the mini medics out there. You can lift the flaps to open Molly’s case and inside, in a little pocket, there are accessories (made of card) that you can remove and use to ‘treat’ the patient yourself. Ivy loves using them to play doctor both with the book and also with her other toys. 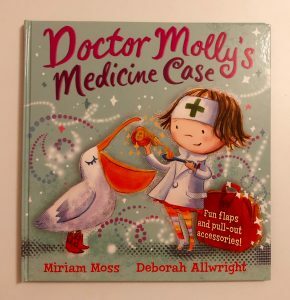 It’s also been a useful tool as a parent – she’s a lot less reluctant to take medicine from a spoon now that she can role play doing it herself with Doctor Molly!